Following the footsteps of Sudoku, Kakuro and Hitori, Slitherlink is the next family of easy to learn addictive logic puzzles which were invented in Japan. Using pure logic and requiring no math to solve, these fascinating puzzles offer endless fun and intellectual entertainment to puzzle fans of all skills and ages. Slitherlink puzzles, also known as Sli-Lin, Fences, Loop the Loop and Dotty Dilemma, were invented in Japan by Nikoli Puzzles around 1989. Yet it seems that similar to the evolution of Battleship puzzles, Slitherlink was also based on an earlier 2-player game. Named Slither, this game involves two players competing against each other on a paper grid by linking gridline segments one after the other without crossing, branching or closing the loop. The player who is forced to cross, branch or close the loop is the looser. Commonly named Sli-Lin by Nikoli's fans in Japan, Slitherlink puzzles made their debut in June 1989, in issue 26 of Nikoli’s Puzzle Times (パズル通信　二コリ pronounced Pazuru Tushin Nikoli). Nikoli’s Puzzle Times is a quarterly mook (Japanese abbreviation of magazine-book) which was first published over 25 years ago. Early versions of the puzzles contained clues in every square. Since then Slitherlink puzzles have been appearing in this quarterly magazine on a regular basis as well as in dedicated books. 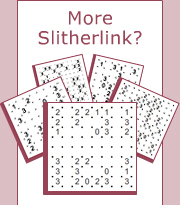 As of 2006, 17 books with over 90 Slitherlink puzzles each have been published by Nikoli. Slitherlink puzzles puzzles have become very popular in Japan, appearing in many magazines, books, newspapers, CD games and mobile phone portals. Slitherlink puzzles are also available for Nintendo DS gamers in Japan by Success Corporation and are estimated to be the third most popular number-logic puzzle in Japan after Sudoku and Kakuro. According to The Free Dictionary slither means “to glide or slide like a reptile”. Thus, Slitherlink can be freely interpreted as “linking by gliding or sliding like a reptile”. The full name as it appears in Nikoli’s books is スリザーリンク, pronounced Surizarinku. The Slitherlink brand name is registered by Nikoli Puzzles in Japan. In December 2006, Conceptis announced the availability of Slitherlink puzzles to its publishers and puzzle fans worldwide. The first release of Slitherlink puzzles offers seven size configurations of 6x6, 7x7, 8x8, 10x10, 10x12, 12x12 and 12x16 in six difficulty levels.